Why it is so popular is hard to work out as there is no special reason for its popularity apart for the proximity to the road. Admittedly there are some fine views from the top which encompass moor and coast alike and there is a lot of industrial archaeological features to be found nearby but these normally go un-noticed by the average visitor. The first mention of the tor was in 1566 when it was called Idertordoune, in a deed of 1687 the name was Ittor Doune and in the recovery rolls of 1762 and 1789 the name was Eator Down and Itterdown respectively. It is suggested that the modern place-name is corrupt and probably was influenced by the nearby hundred of Haytor with which there is no connection, Gover et al, 1998, p.476 and 505. Other moorland names for the tor are: Athur tor, Solar tor, High tor and Hey tor. Crossing considers that Athur tor was derived from Solar tor which an early writer supposed was a place where sacrifices and offerings were made to the Sun God ‘Bal’. 1889 OS Map of the Haytor area. The outcrops of Haytor stand at 1,499 ft (457m) and consists of two granite outcrops and is classified as an ‘avenue tor’ which means that the central section of the tor has been eroded leaving an avenue running between two outcrops. The granite which makes up the tors is called ‘tor granite’ but at the base of the western outcrop is a layer of fine grained granite. Where the tor granite joins and overhangs the fine granite a ‘rock shelter’ has formed. On the top of the eastern outcrop the granite has been eroded to form a rock basin which measures roughly 34″ long, 28″ wide and 10″ deep. Sometime in the 1800’s an iron handrail was erected on this outcrop and steps were cut into it. The handrail was removed in the 1960’s and never replaced. Hemery, 1983, p.693 notes a delightful remark made by a Doctor Coker in 1851 when he said “…the unsightly stair step to enable the enervated and pinguedinous scions of humanity of this wonderful nineteenth century to gain the summit.” Which I think basically means that the handrail allowed the tired, fat heirs of the nineteenth century to gain easy access to the tor. There are very few legends associated with Haytor apart from the ‘Haytor Wedding Gown’ which for such an impressive rock pile is strange. The area around the tors has been inhabited from early times as there are the remains of Bronze Age features not more than a half a mile away at Holwell tor. The medieval deserted settlement of Houndtor lies about a mile to the north-west and so the sight of the mighty granite outcrops would have been familiar way back down the millennia. Today, as previously mentioned, Haytor rocks is one of the Dartmoor ‘honeyspots’. Not only is it popular with visitors it is also popular with rock climbers with climbs ranging from 30 – 50ft such as ‘Zig-Zag’, ‘Athos’ and ‘Bulging Wall’. Over recent years the area has suffered from erosion due to the number of feet tramping up and down from the tor. The aerial photograph below clearly shows the distinct paths and tracks that have been eroded in the area, such is its popularity. For comparison the line running diagonally from the south to the north-east is the B3378 road that runs from Bovey Tracey to Widecombe-in-the Moor. As can be seen in some places the eroded tracks are wider than the two lane highway. Aerial photograph of Haytor Rocks. In 1953 the area was used as a location for the film ‘Knights of the Roundtable’ which starred Robert Taylor and Ava Gardner. 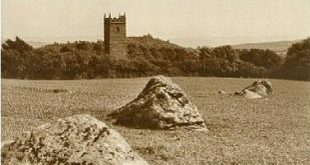 During the millennium celebrations a beacon fire was lit on Haytor rocks by the parishioners of Islington in which parish they lie. To the north west lies Holwell Quarry and to the north-east lies Haytor Quarry both were in use during the 1800 – 1900’s. The more famous of the two is the Haytor Quarry. It was from here that granite was taken for use in building the famous London Bridge with rock used in the west face and the flagstones, Ewans, 1966, p.21. It is also from Haytor Quarry that the ‘Granite Tramway’ runs to Teignmouth. This tramway was designed to carry granite from the various quarries in the Haytor area and take it to Teignmouth for shipping. Work on construction first began in 1776 and was built by George Templer. The route of the old tramway is now a recognised walk called the ‘Templer Way’ and both the walk and the history of the tramway can be found on an excellent website called ‘The Templer Way’. Recently Haytor has reached the national headlines as some bright spark is campaigning to get a stair lift installed at the rocks to enable disabled access. And in July the Devon’s contribution to the BBC’s ‘Big Dance’ took place on and around the tor. Around 400 people turned up to perform a specially choreographed dance to the accompaniment of a troop of Taiko dancers. Now doesn’t that lift your heart unto the heavens, I bet they couldn’t get 400 people to turn up to a litter-picking event? Ewans, M. C. 1966 The Haytor Granite Tramway and Stover Canal, David & Charles, Newton Abbot. I must be doing something wrong, because The Templer Way website doesn´t offer practically any information at all, except about Stover Country Park. Very disappointing. However, I would like to congratulate YOU on your Legendary Dartmoor website. Enjoy very much reading it and learning from it – whilst we ramble around with my husband and our grey-HOUND 🙂 Thank you!